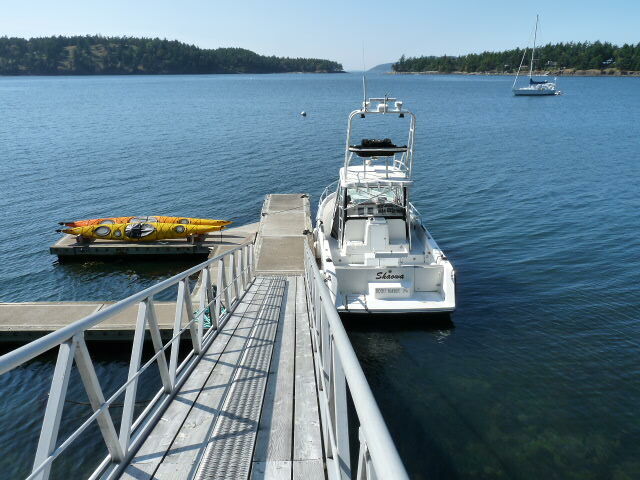 02/20/2018 Update: On San Juan Island/Pearl Island and Henry Islands there are currently 11 docks for sale.There are 8 residential homes with docks, click Here.. There is 1 vacant parcels of land with a dock and this one in in Reid Bay on Stuart Island click here for this parcel.. Last but not least there are 2 30′ condo docks available, all in Friday Harbor. One of the best dock locations on the market is located at 458 De Haro Lane in Mitchell Bay. This 155′ pier goes out to a float with 51′ and 45′ slips. This dock looks right out the entrance of Mitchell Bay due west to Henry and Vancouver Islands. Just minutes away to prime fishing and whale watching grounds. Docks are becoming extremely valuable Real Estate due to increasing regulatory hurdles that property owners are faced with. If one can manage to get a dock permitted, chances are it will be a community dock that is shared with neighboring properties. If you have any questions about boating in the San Juan’s please feel free to contact us or if you are looking for docks outside of San Juan Island, please feel free to contact John jdl@windermere.com or 360-378-7836 .